Prior to opening this Dragon Phoenix, I worked as an elementary school teacher for six and a half years. My goal as a teacher continues to be, "Helping students to make wise decisions and to grow into kind people who have a passion for learning and growing." As my skills as a teacher grew, so did my desire to always become a better teacher. I saw that at the heart of learning was a need to have confidence to accept the world how it is, and that there are many ways to grow. Martial Arts has had an incredibly positive effect on my life and has helped me to be a better person. It has helped me to find peace when I was angry. It has helped me to stay fit and active so that I feel good in my body and can do fun things in life that make me happy. It has helped me to keep my mind sharp and it has helped me to feel more connected with the world around me. These are reasons why I have decided to combine my love of teaching with my love of Martial Arts to share with others. I hope that my students may gain the self-diclipline, control and wisdom to seek harmony in their lives and find inner peace so they can be successful wherever their paths may take them and to help make this world a better place. I began my studies in martial arts in 1998. I started in Taekwondo under Kevin Heckert (5th deg. ), earned my blackbelt, and became an instructor. When I moved off to college I got the opportunity to work with other blackbelts from different systems and explored some other styles as well. I later moved to Memphis where I met Chris Wiley (5th deg.) who took me through much of the PasaRyu system as one of his only students. During this time he was making trips to China to study Yin Baguazhang from Hejin Bao, which he would then share with me. This was my first exposure to internal martial arts and showed me that what I was looking for was out there. 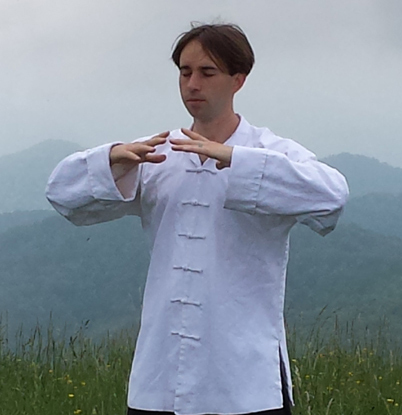 In 2006 I moved to Asheville and began studying Chen Tai Chi under Sifu Frank Paolillo. In the time that followed, I learned the styles of Dragon Baguazhang, Pao Choi, Praying Mantis, and Tao. I continue to study to this day and consider myself an Eternal Student. No matter how good one becomes, there is always room for growth. When I’m not teaching or studying Kung Fu I’m likely working at Dragon Gate Farm, digging in the dirt or fixing up an old house. Its a fairly simple life, but I wouldn’t trade it for anything. 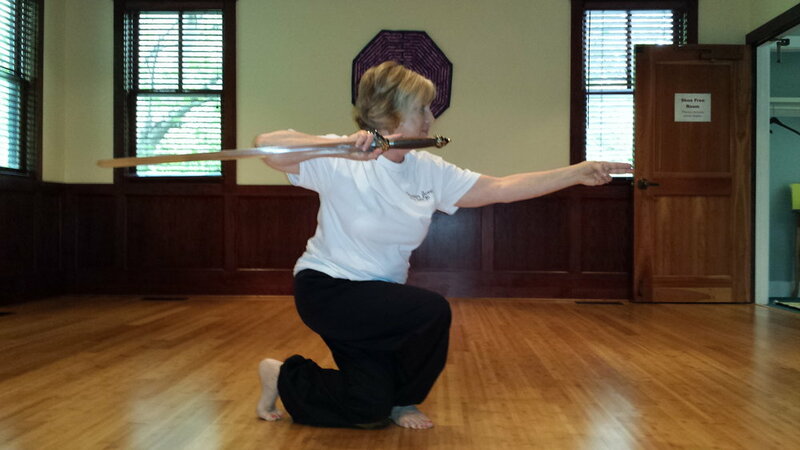 Bonner has been studying Chen style Tai Chi and Baguazhang since 2010 at the Tao Institute under Sifu Frank Paolillo. Theses styles include many qigong forms, including silk reeling. She earned her degree in Theatre Arts at Auburn University in 1978 and has been directing and teaching all ages for over 35 years. Her experience in dance, creative movement, and athletics has motivated her to learn Kung Fu. It incorporates the body and mind, and has healing benefits along with stretching and constant spiral movement. "Silk reeling soothes my spirit and helps me to focus and relax." Victoria Rivera discovered yoga in 2006 and soon after realized that coming to the mat daily was life changing. With a passion to share this knowledge, she completed her 200 hour Teacher Training program at Yoga Darshana in West Babylon, New York in 2015. On the quest to further her knowledge, she has trained under David Robson, owner and director of the Ashtanga Yoga Centre of Toronto, and Kino MacGregor, co-founder of Miami Life Center. She leads a heart opening, meditative inspired class that combines her dynamic love of movement with the practice of yoga. Her classes are designed to gently guide students along their own ever evolving practice, and ultimately to find joy in every moment on and off the mat. Victoria believes that yoga is truly for everyone. Carley first learned about yoga in the summer of 2015 and has continued practicing ever since. With yoga and meditation, she believes that you can create a support system to navigate life, as well as a practice to deepen your heart. She strives to teach balance in the mind and the body to manage through the emotional times in life, and self-love. In this over-stimulating world, April believes now more than ever, in the beauty and power of going within. Through yoga, April aspires to create safe spaces for people to open up and be comfortable expressing themselves exactly as they are; spaces where people can feel empowered in their bodies, voices, and choices. She believes that yoga is a place to give people permission to deepen into the magic that they are, a place to invite people to move into stillness, a place to encourage people to trust themselves, and so much more. April completed her 200-hour yoga teacher training at the Asheville Yoga Center with Stephanie Keach, Sierra Hollister, Joe Taft, Shala Worsley, Kimberly Puryear, and a cast of other inspiring teachers. She’s overjoyed to share with others. Chelsea first tapped into her spirituality in 2013 by discovering the beautiful practice of yoga and meditation. She quickly developed a passion to share her newfound knowledge and did so by traveling to different conscious events leading workshops on mindful and evolving topics While diving deeper into this lifestyle and immersing herself into the yoga community, she found Acro Yoga. Acro took her practice to the net level; heightening her vision for all to experience the connection, patience, trust, strength, community, and insight that this playful path provided. Chelsea received her RYT200hr certification in 2016 and loves to combine mindful, therapeutic, partner, and acrobatic yoga in her classes. Chelsea currently teaches yoga and acro in Asheville, North Carolina and continues to learn from great instructors, pulling from their lessons and wisdom to mold into her own teachings. Sarah’s teaching style is welcoming, thoughtful, and eclectic. Her approach is influenced by her diverse and ongoing training with teachers from the Anusara, Jivamukti, and Ashtanga traditions. In 2012, Sarah completed her RYT-200 certification. Since that time, she has taught beginners, children, elders, and folks from all walks of life. A committed practitioner, she has come to trust the power of yoga as a healing and balancing way of life. Infused with wisdom from yogic texts, inspiring music, and uplifting sequences, her classes offer students a safe place to explore and enjoy all the benefits of yoga. Through encouragement, proper alignment, and a sense of playfulness, students of all abilities safely build stamina, confidence, and strength.